Do you date your spouse? Let’s talk about ways to date your spouse today. The concept of ‘dating’ never somehow goes with a husband and wife. Dating is excitement and novelty with a good mix of ‘zaalim samaajh’. What’s exciting about a spouse who sees you at your worst? What’s left of novelty with a partner who lives with you 24/7. As for ‘zaalim samajh’, you realize now how it made all those furtive glances, first moves and difficult meetings worth it. Now everything is easy and routine. Throw in children, work, and financial challenges and dating your spouse is the last item on your endless “to-do” list. Jaffar gets a few Fridays off in the year when both kids have school in the morning. 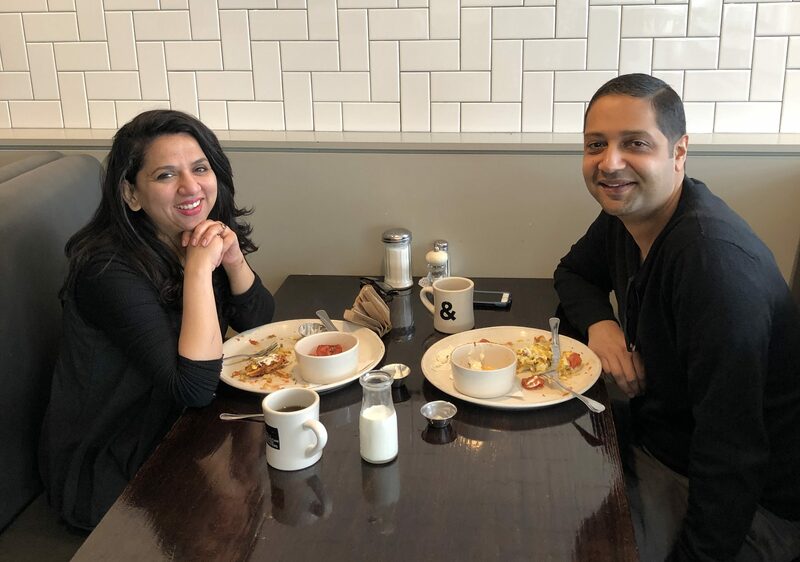 We have been married ten years and practicality dictated that we used these rare mornings as opportunities for doctor visits, errands, car appointments and volunteering at the kids’ schools. However, we realize now that it’s important for our relationship to spend some quality time together. That means a time where you put the phones away, and not talk about the kids or pending house work (usually 80% of our conversation). Since many other parents face challenges similar to us, especially the lack of reliable babysitting, I thought I would share some ways to date your spouse. Do make sure you connect with other parents and exchange babysitting services with each other. Brunch at a favorite spot in the city. A one-hour walk in your favorite park. Meet for dinner and discuss a book/movie both of you saw. Put the kids to bed early and play a board game together. Take a class together: art, music, exercise etc. Go to a coffee shop together and discuss a dream vacation (don’t involve finances, just something both of you would like). If you could have a secret power what would that be? Watch a movie (at home or in the cinema). Walk through a museum together (many have some occasional free nights). Go for dinner with another couple. Enjoy a couples massage together. We recently enjoyed a couples hammam together at Soma Spa in Calgary and it was truly a relaxing experience that makes a cherished memory now. Hammam is an ancient and traditional cleansing ritual and has evolved over time to become a sought-after spa experience. It draws out deep impurities, accelerates blood circulation, releases toxins, and relaxes the mind and body. The heated stone bathing slab increases the body’s temperature, stimulates the immune system and helps the body detoxify. As soon as we entered Soma Calgary, we felt relaxed with the calming ambience of the spa. I loved the spa etiquettes that they had framed at the entrance. That helps set the tone for the experience. As we filled out initial forms, there was gentle music playing the background and we could enjoy lemon water, green tea and delicious cookies. We were then led to a private hammam room that was tastefully decorated and lit. We took turns as one person laid on the heated stone receiving a full body ‘kese’ wash while the other person got an essential oil foot bath enjoying cookies and green tea on the side. The treatment is finished off with a full body rinse and body butter application. We left feeling rejuvenated and relaxed. It was truly a great memory together. Hope you enjoyed all these ideas and ways to date your spouse. Do remember that one of the best ways to give a loving home to your children is to love your spouse. Disclaimer: The Couples Hammam was a gifted experience by Soma Calgary. All opinions are my own. Next Post Pedalheads Review: Teaching Children to Bike and Lots More!